Enjoy a guided night walk through the Town of Easton, historically the “Eastern” capital of Maryland. Hear about the spirit of Marguerite, the murdered actress found in the elevator of the Avalon Theater. Learn about Mr. Grymes who is still demanding fine service of the staff at the Tidewater Inn. Meet “The Colonel” who haunts the courthouse and the phantom man in a blue suit who rides the elevator in the old jail. Hear how the spirit in the old Odd Fellows hall has “touched” the staff at the Clay Bakers. Visit the Home of the Friendless, the Eastern Shore’s oldest orphanage and listen for sound of Solomon Barrett playing his fife and drum in the old cemetery that also has two “healing trees.” The scariest stop of all will be at Foxley Hall, the most haunted house in Easton where mist and fog frequently appear inside the kitchen and living area, and where the screams of a woman are sometimes heard from a 3rd floor room. You’ll learn much about Easton’s history and more about the spirits that still hang around. 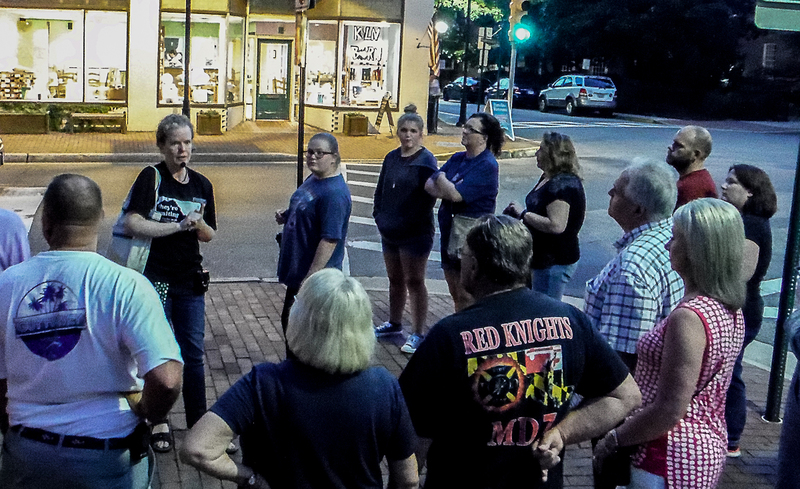 SITES ON THE EASTON GHOST WALK include the Talbot County Court House and old jail, Tidewater Inn, Avalon Theater, the old Easton hospital, the Odd Fellows Hall, the former “Home of the Friendless” which once served as an Eastern Shore orphanage and Foxley Hall – the most haunted house in Easton. Also included is a walk through Spring Hill Cemetery, a place where 10,000 Eastonians are buried. When the old Avalon Hotel – a Victorian hotel that once occupied the same site as the Tidewater Inn – burned down in 1944, the space on the corner of Dover and Harrison Streets remained vacant until 1947 when Arthur J. Grymes, Jr. broke ground for a new – all brick – hotel. The Tidewater Inn was completed in 1949 and operated under Mr. Grymes’ guidance. He carefully ran the hotel until the day he died. But hotel staff from cooks, to bellman, to General Managers have all claimed to see Mr. Grymes walking the halls, climbing the stairs and entering the lobby. The Tidewater Inn is just one of the haunted properties on the walk. The Avalon Theater and stories of a ghost that rides the elevator will also be a highlight. And the old Home of the Friendless that was formerly a large house where orphans from all over the Eastern Shore were placed. Other places on the Easton Ghost Walk include the old Talbot jail, the Talbot Courthouse, the Odd Fellows Hall, Easton Emergency Hospital, Spring Hill Cemetery, Foxley Hall, John McDaniel House and Home of the Friendless. Easton is approximately 30 minutes east of the Chesapeake Bay Bridge. SITES ON THE TOUR include the Tidewater Inn, Avalon Theater, old Easton Hospital, Talbot Court House, Talbot jail, Spring Hill Cemetery, Foxley Hall, Home of the Friendless and more. MEETING PLACE: Meet in front of Tidewater Inn at Dover and Harrison Streets. TIME & WEATHER: Ghost Walk begins on time. We walk in all kinds of weather except heavy rain and thunderstorms. Dress for the weather and be aware that each ghost walk takes at least an hour and covers between 1 and 1.5 miles. HI, I heard on the radio the other day when you were on 96.7 about a magical tree. I missed what was said. Can you email me more about this tree. I heard that it doesn t usually grow in this area and related to the Mayan days. Please fill me in. The old Black Decker building is haunted. I know of some other places in Easton that I don’t see on here either. I would like to purchase 2 adult tickets for Saturday the 18th in easton. Hey Milissa. You can purchase the tickets online at http://chesapeakeghostwalks.com/event/easton-ghost-walk-4-2-2/. I live in New Castle Delaware and would like to bring my niece to one of the walks. Which walk in which town would be the closest to me. Neither one of us has been on a ghost tour. And I wanna make sure she likes it before I go away too far. Hi Kim. The Upper Shore Ghost Walks would be closest – those are Easton, St. Michaels, Denton and Cambridge. The actual closest is Denton and that’s a great walk but it only occurs every couple of months. Easton would be next closest and that is every month, then St. Michaels and Cambridge are about equal distance. I hope to see you on one of these. They really are a lot of fun and I’m not sure how old your niece is, but young people especially love these walks. Thanks for looking us up.